Not a true, chippy “milk paint” but a high tech acrylic product, it is fabulously adaptable & UV resistant. Milk Paint can be used indoors or out & applied to furniture, crafts, and cabinets. Easy to use – consumers can hand apply or professionals may spray. It is the furniture paint with soul. You can mix it, lighten it, distress it, glaze it, layer different colors, antique it – perfect for upcycling or repurposing furniture. Available in 28 mixable colors. 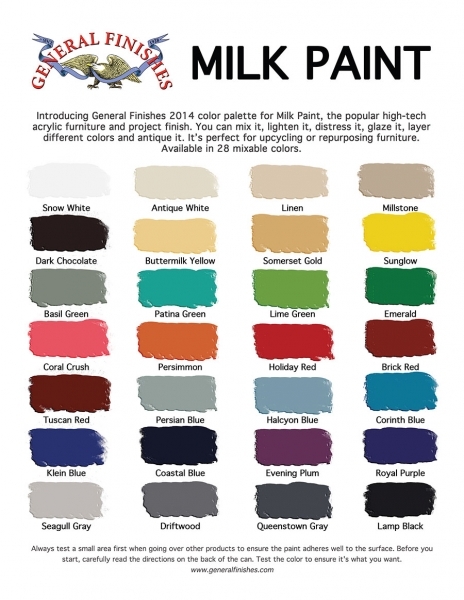 General Finishes Milk Paints are self sealing, so you do not always need to use a primer. You may use a stain blocking primer if you need to seal knots, or are covering grain, dark, or red colors (reds tend to bleed). You may also use a stain blocking primer if you’re painting light or white, or if you’re painting a wood that is known to bleed through your paint like pine, oak, mahogany, or cherry. You may not wish to use a primer if you are sanding down to bare wood and glazing as you will see the primer. For more information on how to use these products, visit our store or take one of our furniture painting workshops!